The demonization of the Russian president as a defender of tyrants and a threat to democracy prevents us from seeing that behind Vladimir Putin’s back, another Leviathan has risen. Its backbone is made up of officers of Russia’s intelligence services who retreated after the fall of the USSR into business and politics and emerged into service again with new backgrounds at the end of the 1990s and early 2000s. They merged with the same community as the criminal underworld and field commanders; this community is de facto the collective decision-maker in big business and politics in Russia. It is important that this community is not the state, not a political corporation and not even a conspiracy – it is just a network managed by the invisible hand of the market. This is a market of violence where financial flows and political statuses – goods, terrorist acts and local wars with accompanying media – are the business processes; warlords and military professionals are the market participants, and jihadists and other ideological volunteers and mercenaries are the proletariat for whom no other industry has been found. On this market, for the sake of his own interests, a freelancer can organize a terrorist act or provoke a war. The market of violence links two external threats mentioned by President Barack Obama in his farewell speech: terrorists, speaking on behalf of Islam, and autocrats fearing to lose their power. This is how the stock exchange links buyers and sellers. How did this happen? The early 1990s may be considered a conditional point of reference when unemployed intelligence officers of the collapsed USSR went into criminal business. Already by the mid-1990s, powerful mixed structures had been formed. One of them emerged in St. Petersburg on the basis of the so-called “Tambov” criminal association and groups of former and current Federal Security Service (FSB) officers, some of whom joined the famous Ozero [Lake] Dacha Cooperative. Now it is common to link nearly the entire upper echelon of Russia’s political elite, headed by the president himself with Ozero. The Tambov organized crime group spread its influence throughout a large part of the post-Soviet space. Now the activity of this gang and the people connected to it are actively being investigated in Spain. But a description of the market of violence in criminology terms clearly does not capture the entire scale of the phenomenon. The association that by the mid-2000s, after the seizure of YUKOS’ assets, became dominant in Russia and its oil extraction sector is not a classic corporation nor a political party but a complex intertwining of criminal, administrative, professional, kin and friendship ties through which the raw materials rent of Russia is pumped and re-distributed as if through capillaries, extracting for oil alone more than half a billion dollars a day. No bureaucracy can control such a network. Therefore, Russian global “initiatives” – from the Olympics in Sochi to the advancement of the Russian World in Europe to the war in the Donbass – are above all, instruments for managing the market – their own kind of interventions. Oligarchs or warlords, depending on the specific nature of the task to resolve, recruit military professionals, bankers, political consultants and even musicians for the accumulation of cash. Some finance the military operation in the Donbass, the building of the Roza-Khutor resort at the Sochi Olympics or a bridge over the Kerch Strait in the Crimea; thanks to this bridge, the construction market in Russia has maintained its size. Others create the Novorossiya Museum in St. Petersburg or provide media support for the war in the Donbass. Still, others give concerts in Palmyra after ISIS leaves. In doing so, Moscow has become more and more frequently a hostage to these initiatives and their bold executors, who dictate to the center the political agenda, proceeding from their own economic interests. This relates to the war on terrorism, which has turned into the main political resource of the intelligence services, and to Chechen leader Ramzan Kadyrov, who tried to become an Islamic leader on a world scale, and to Igor Strelkov (Girkin), who turned the “Russian World” from a cultural into a military project. Starting in the late 1990s, the battle against terrorism became the chief policy in the North Caucasus and the centerpiece of the political agenda in Russia, displacing the Chechen war for independence from both the field of battle and the news headlines. Regional politicians with private armies, Russian military, intelligence services, criminal and field commanders of jihadist groups created a new reality. This was their common business, the economics of which was built on the plundered state budget, kidnapping, the arms trade and racketeering. In Dagestan alone, the Russian region neighboring Chechnya in the North Caucasus, during the years of the war about 900 people were abducted for the sake of ransoms, and on the informal arms market near Nazran (in Ingushetia, Russia) weapons were for sale which had come through a few intermediaries directly from the warehouses of the Russian Ministry of Defense. For a decade, the Caucasus Emirate, which was represented by Doku Umarov in 2007 as a sub-division of the international terrorist organization Al Qaeda justified all this activity. The conflict in Syria and ISIS altered the scale of the entire project from the regional to the global. Already by mid-2014, no fewer than 2,000 people from Russia were fighting against Bashar al-Assad. When Abu Bakr al-Baghdadi, the leader of ISIS, declared the caliphate and unleashed a global propaganda campaign, Russian-language Muslims poured into Syria from all over the world. About 2,000 Chechens set off for the war from Europe and Turkey. International brigades of a post-Soviet provenance consisting of al-Baghdadi’s troops and allies from Abu Mohammad al-Julani’s Jabkhat-al-Nursa helped to blend the Syrian opposition with terrorists and substantially reduce and even block international support to opponents of Assad, whose regime Putin, Iranian and pro-Iranian militarized formations have successfully rescued in recent years. Today, there are at least 5,000 jihadists with Russian citizenship who have joined ISIS. And there are now already hundreds of thousands of Muslims pushed beyond the red line, forced to emigrate from Russia, Azerbaijan and the countries of Central Asia. With the existing anti-Islam discourse and “glass ceiling” for the second generation of Muslim migrants in developed countries, a certain success among post-Soviet Muslim prophets of radical Islam is guaranteed. 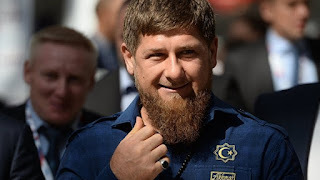 The second project – “Ramzan Kadyrov” – also began in Chechnya in the early 2000s and in a decade and a half, the existence of “Kadyrov’s Chechnya” turned into a personal network for the head of the republic, having as assets a territory with a population of nearly a million people under his control, a consolidated budget of several billion dollars and a criminal agents’ network based on the transnational network of Chechen diasporas throughout the whole world. Businesses, media projects and non-commercial organizations are built into this network, for example, the Akhmat Kadyrov Foundation, named for Ramzan’s father, which performs the role of an informal treasury. It is impossible to clearly distinguish among the jihad, criminal and Kadyrov networks, which are almost equally penetrated with intelligence agent networks. Finally, there is the Ukrainian project, one of the initiators of which is Igor Strelkov (Girkin), who provoked the war in the Donbass in 2014. In late April and early March of 2014, there was the annexation of the Crimea, and in April, war began in southeast Ukraine. An FSB colonel in reserve, Strelkov, acting as a freelancer and using investments which financial analysts regard as venture capital, was able to provoke war in southeast Ukraine, which now has already cost thousands of human victims and brought tens of billions of dollars in income for opportunists from the criminal underworld and intelligence community, who have created a network of many thousands of people to support the Novorossiya project in the Russian regions and mobilized tens of thousands of new combatants. In 2014, with the ID of an officer of the GRU and personal weapons, it was possible to cross the border of Russia’s Rostov Region into Ukraine’s Donetsk Region to a territory controlled by pro-Russian armed formations, and a year and a half later, it was possible to have “your own business” in Donetsk: several thousand fighters, armor, your own prison for hostages and a hotel to use as a military base. The subsequent liquidation of the “media stars” among the field commanders such as Aleksei Mozgovoy or Motorola (Arsen Pavlov) was a kind of gentrification of the balance that developed between the commercial interests of warlords inside Donetsk, their backers in Russia, and business partners in Ukraine. An unplanned result of the realization of these and similar projects is a formed, dynamic network of military professionals answering only to the market and acting independently in various regions and countries – in the post-Soviet territory, the Middle East, Northern Africa, Central and Western Europe and North America. Bureaucratic counter-measures like sanctions, building walls, visa restrictions and the war on international terrorism lead to the growth of a social base for the market of violence and stimulate investment in it by those for whom the path to the open economy is closed. Autocrats and warlords disrupt attempts at reforms and finance conflicts, defending and expanding their political territory. They are decisive, free from checks and balance and easily find allies among respectable bankers and populist politicians, and they have a lot of money. And the main question, possibly, is not so much the war on terrorists who are only a symptom, but how to force their rich clients to invest in order and not chaos.